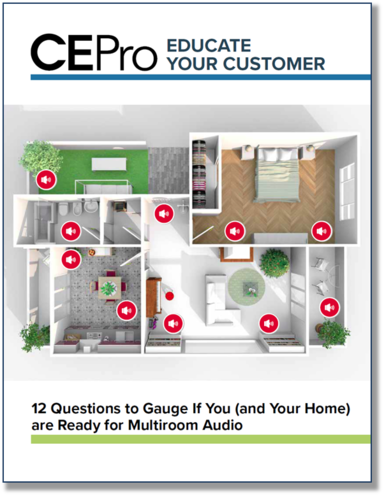 If your customers have been debating whether or not to make the investment in multiroom audio, here's a free guide to help. Whether your customers are fans of vinyl or streaming music services, there’s no need to sequester all of those great tunes to one room. An audio distribution system is able to deliver songs to multiple speakers so that the entire house is blanketed … or, they can choose just a couple of areas for the music to play. That’s the beauty of a whole-house audio system: it offers endless options for music listening. The adults can kick back with the classics on Pandora on the patio, while the kids blast hip-hop in the rec room. The components you’ll need are fairly straightforward: source equipment (like a media server), a switching/processing device, and however many sets of speakers you deem appropriate. Even if the house is already built, there are scads of wireless options so you won’t have fish wire behind the walls.